New Year, New You - right? If your 2019 plans include becoming a healthier version of yourself, you don’t have to make HUGE changes to see a serious impact. In fact, it can be as easy as brushing your teeth. Think about it: you brush your teeth twice a day (we hope!) for 2-3 minutes at a time. New York Times writer David Gelles suggests taking this time to tune into yourself - to meditate - and turn this mundane task into a way to welcome mindfulness and “set a peaceful tone” for your day or night. Meditation can ease stress, control anxiety, enhance self awareness, lengthen attention span, and so much more. We’re into it. Want to try it? Check out the full article here! We caught up with Joey who recently came in for a Floss Bar smile upgrade to learn some of his best wellness, fitness and healthy food tips! I am a 25 year old fashion influencer from NYC! I also work as a Merchandiser for Macy's! I love travelling and exploring new places and adventures. I brush 2x daily as well as use mouth wash. I try to floss weekly but often forget. I would like to add more to my routine! I live by the 80/20 rule. Try to make healthy choices with what you eat and do 80% of the time. Leave room for a lazy day or a bad meal because life is too short to not indulge. But try to eat healthy 80% of the time and eat proportionally. Also try to be active daily even it is just a walk or stretching at home. I work in midtown - so i am limited to the options near me but I love Sweetgreen salads and Market Crates, I often prepare my own meals and follow recipes from Cooking Light magazine! I try to make it a part of my daily routine and lifestyle so it feels less like a chore. I also switch up my workouts to keep it interesting and to keep my body from becoming too comfortable. I will run 2-3x a week, lift weights 2-3x a week, play soccer here and there. Attend a yoga class 1-2x a week. I also try to attend some bootcamp style classes or HIIT workouts to get a really tough workout in 1x a week! But diet is most important or this is all wasted effort. There is no bigger confidence booster than a great smile! But how do you make sure your smile stays great? We got you! Our fantastic Lead Hygienist, Donna, will answer common questions and talk you through the teeth whitening system and process we use at Floss Bar. Do I need to worry about my teeth enamel? There is a lot of uncertainty and myths out there when it comes to teeth whitening, and we are going to dispel them right now and give you the hard facts. There are two ingredients that brighten the color of your teeth. Namely, carbamide peroxide and hydrogen peroxide. Both of them do the exact same thing. They get absorbed into you enamel and break down stain molecules. Some do it faster than others because of a higher concentration. Over the counter products have a very low concentration within the ingredients to make sure you don’t hurt your gums while freestyling at home. This is why we recommend you have your whitening done by a professional. The concentration of the peroxide is much higher, and give you the result you want much faster. At Floss Bar, we use Pola Office+. The 4 cycles of only 8 minutes ensures that the material is removed before any harmful effects on your enamel can take place (wohoo!). Why should I use Floss Bar's whitenings over other systems? The Pola Office+ system we use has a few advantages over other systems on the market. It is less expensive than all the other systems out there all the while being just as effective and safe. Pola Office+ has 37.5% hydrogen peroxide, which means it works the fastest and your results are immediate, saving you a ton of time. Your procedure will take just 32 minutes. What if I experience sensitivity? Long term use of any whitening product can be harmful to the tooth structures which is why we chose the fastest product in the world. All professional whitening products as well as the ones you purchase in the store, can cause sensitivity. This is why we always recommend you use a desensitizing toothpaste before and after the procedure as well as using a fluoride rinse at home. After the procedure we also recommend an in-chair fluoride treatment. All of these preventative and post care treatments will lessen your sensitivity. OMG, my gums got whitened!! Don't worry! Let me ask you a question. Have you ever had a cut and put peroxide on it? Did it turn white and bubble up? I’m sure your answer is yes. Peroxide has an ingredient that turns the skin white while killing bacteria. So, when you have your teeth bleached it is the same concept. If the active ingredient, (peroxide) comes in contact with your gums it can cause that area to turn white. It will return back to its normal color within 24-48 hours! Kids, don't try this at home, come to Floss Bar and we will get it right. At some point in the past few years, "busy" became the new normal. And we all know that in NYC, busy generally means REALLY REALLY busy. So how are we supposed to take care of ourselves when we barely have time to sleep? NYC Fitness Trainer and model Evan Bett gives us a little background on how he stays healthy and fit in NYC, and tips for how you can make simple shifts to being healthier even when there's just NO time. Hey Evan, give us the low-down. Who are you and what brought you to NYC? I moved to New York in 2014 to pursue a career in modeling. I signed with Wilhelmina Models NYC and have been modeling with them ever since. I work with brands like NIKE, Under Armour, Mens Fitness Magazine, Mens Health Magazine, Fiji Water, and Perry Ellis just to name a few. Upon moving to New York to became a NASM certified personal trainer and began training and teaching group classes at a gym called Tone House. I've since expanded my reach to another gym called Performix House. In summer 2016 I filmed on a show called "So Cosmo" which highlighted the ins and outs of what it takes to make Cosmopolitan magazine happen. Specifically I was the fitness contributor to the magazine. The show aired in fall 2017. After that, I continued modeling, training, and dove into the world of social media influencing with a new audience, reach, and platform. I've partnered with a few amazing brands and have gotten to work with a lot of great people. I typically brush the standard two times a day, and floss at night. My last professional cleaning was in November. At Floss Bar, I had a cleaning and whitening done. It seems like everyone is on the go lately. What tips do you have for people who need to want to stay healthy but can't seem to find the time? 1. Prep for the following day the night before. There's nothing worse than scrambling in the morning to pack, eat, and get out the door on time. If your prep the night before, you can use the extra time in the morning to set your intention for the day. 2. Pack a lunch. We fall into the trap of eating garbarge on a daily basis because its "convenient." If you meal prep before hand, you're prepared for your day with a healthy option to keep your body happy. 3. Drink a lot of water. You're body, and brain, function so much better if you're properly hydrated. A lack of water throughout the day leads to dehydration and fatigue among other things. We can totally do this too. 4. If you're on the go in the city, try walking or biking to your destination rather than taking a cab or an uber. The activity can keep your body and brain functionality elevated while getting in a little workout at the same time. 5. Backpacks over Messenger Bags. Messenger bags typically throw off your alignment, loading the body on one side, and can be strenuous over time if you use it everyday on the same side. Backpacks may not look as cool, but are much less stressful than messenger bags. What's your favorite healthy meal in NYC? Places I go to get healthy food in the city: Tone House Fuel. Dig Inn. Sweet Green. The Little Beet. Nature Works. Deliciously Fit Grill (ordered meal prep). Sun Basket (order to cook at home). Lastly, how do you stay so insanely fit? What is your exercise routine? We need the deets. How do I stay fit? Being a trainer/ fitness model in New York, there is no shortage of places I can go to workout. I workout at Tone House, Performix House, Equinox, Chelsea Piers, Rumble Boxing, Switch Playground, and Brooklyn Boulders on a consistent basis. I love keeping a variety to my routine so that I never get bored or plateau. I'm in a constant state of wanting to get better, and essentially staying ready for anything life throws at me. We love it when we can learn from our amazing patients and we know you will appreciate this too! We recently saw Bianca Jade (MizzFit) for a teeth whitening and of course grabbed the opportunity to ask about her fitness routine and best wellness tips. Hey Bianca! Tell us a bit about yourself? Sure, I’m a girl from St. Louis Missouri who came to NYC to experience the world at large. I wanted to be immersed in culture and a cosmopolitan city where there’s more tolerance than hate. I spent 17 years here becoming the healthy and entrepreneurial woman that I am today. I founded Mizzfit.com, the Mizzfit Box, created a career in television and digital hosting and became a part of a huge wellness network that enriches my life every day. I feel blessed to do what I do and live in a city that has allowed me to flourish. I brush my teeth a lot more than normal. Probably at least 4 times a day. Is that too much? I should probably floss more though. Don’t tell! and be honest, How often do you go to the dentist? I go to the dentist between 2-3 times a year for cleanings, check-ups and such. please help us, What are your best wellness tips for busy people? 3) try and find the time to work out 3 times a week for at least 45 minutes. I mostly go to grocery stores and markets. I focus on buying food that’s fresh and inspirational. And by that I mean that it makes me want to cook and get creative by mixing together lots of ingredients what will nurture my body and give me good energy. I stay away from bodegas and junk food places where I can’t get healthy food. I work out every day. I do high intensity fitness one day and then something more restorative and lengthening the next day. I incorporate lots of cardio, strength training with weights and then yoga at least 2x a week. Also, I am what I eat and I work hard at eating food that will complement the results of my fitness routine. We hope if you've landed on this page - you're in agreement that Floss Bar is a pretty damn good idea. Creating a way to make mouths around the country a whole lot healthier - what's not to love? Not too long ago - Floss Bar was JUST an idea of our incredible founder, Eva Sadej. Want to hear exactly how Floss Bar came to be? Read on for the full story, in Eva's words. I founded Floss Bar in 2017 to innovate dental - an industry in desperate need for it. It all started when I was trying to book a hygienist appointment for my Canadian boyfriend and I learnt what a hassle it was for someone without insurance, how expensive it was and how limited the opening hours were. Taking half a day off or call in sick to get to the dentist just doesn’t work for most people. Looking into it further, I found out that 40% of Americans are not going to the dentist at all. What really scared me though, was finding out that 80% are suffering from serious gum disease that can lead to detrimental health issues and in worst case cancer. Learning that these can be completely avoided by regular dental visits and good oral hygiene, the Floss Bar idea was born. I decided to make routine dental care that is necessary to remain healthy as easy and affordable as booking a room on AirBNB, to make it accessible to everyone. From the busy professional with great insurance cover, the uninsured freelancer or startup coworker, the family to the less affluent - no discrimination. We also developed our innovative mobile dentistry service where we bring hygienists directly to you, your family or your team at work. Floss Bar is actively addressing the hurdles holding people back from going to the dentist. My long-term goal is getting Americans back into the dental chair for their recommended twice a year cleanings to help them avoid unnecessary diseases and optimize their health. In the start up world, work never ends. Our founder, Eva, knows this all too well. Living, breathing, sleeping Floss Bar - it's a labor of love that is WELL worth it. One of the most important ways to get the word out there? Pitching yourself, and your new business, anywhere and everywhere you go. 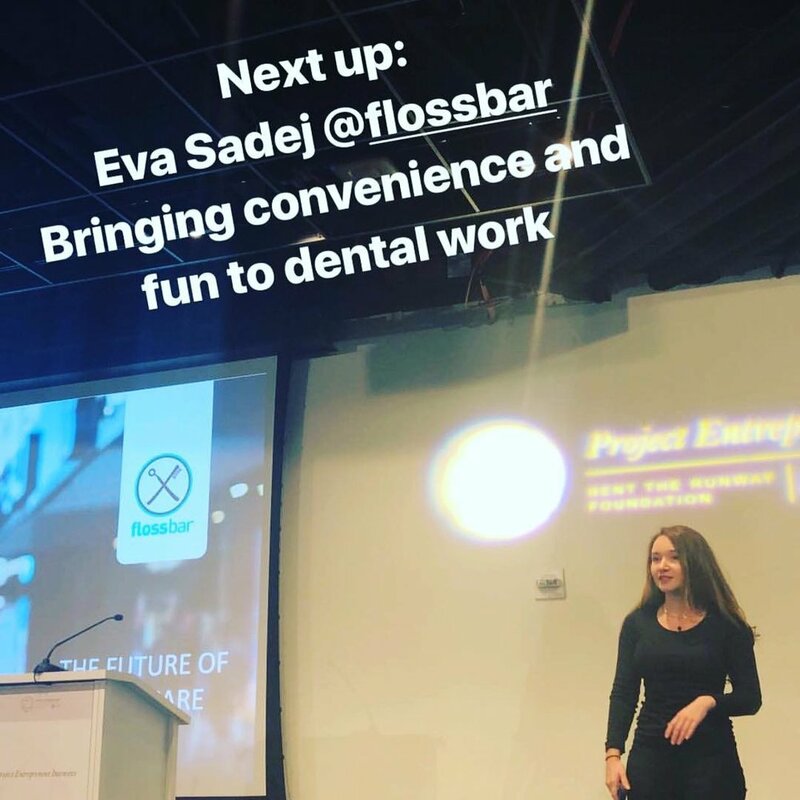 This weekend, one of those pitches is paying off for Floss Bar - Eva has been selected as one of 10 finalists for the Project Entreprenuer Venture Competition. Can we get a hell yea? Project Entrepreneur is founded by Rent the Runway creators Jennifer Hyman and Jenny Fleiss in an effort to encourage other women to start disruptive businesses in all categories. Women start companies at a rate 1.5 times the national average but account for less than 10 percent of founders at high-growth firms - and Project Entrepreneur is here to change that. Check out Eva's interview on the PJTE blog HERE. Floss Bar: Hey Allie! Tell us a bit about you and what you do? Allie: I am Allie from Healthy Alibi. I am a health coach who loves motivating people to be the healthiest, best versions of themselves. Floss Bar: what is your home teeth cleaning routine like? Allie: I brush my teeth probably 3x a day, use mouth wash a few times a week and floss everyday. Floss Bar: What did you have done at Floss Bar? Allie: I had a teeth cleaning at floss bar and my experience was super positive. The technician was very helpful and gave me some advice on brushing too hard, which I didn't even know I had an issue with! Afterwards, my mouth felt so fresh and clean. Floss Bar: how often do you go to the dentist? Allie: I go to the dentist every 6 months. Floss Bar: what are your best wellness tips for busy people? Allie: My health & wellness tips for us busy bees out there are definitely to meal prep, workout in the morning and take the time to practice self-care. Floss Bar: where do you go to get healthy food in NYC? Allie: My favorite healthy food spots in NYC are springbone kitchen, ellarys green, little beet table and Jacks Wife Freda. Floss Bar: Lastly, how do you stay so insanely fit? What is your exercise routine? Allie: My favorite exercise routine is definitely Barrys bootcamp. I do it 5-6 days per week and I absolutely love it! Learn more about Allie here! how to take best care of your baby's teeth? OUR IN-HOUSE DENTAL EXPERT, YASMIN CHEBBI, DMD is back! As we mentioned in a previous blog post, good oral care and healthy gums is very important for developing babies. So is maintaining a healthy lifestyle overall, smoking and drinking when pregnant can use serious damage to babies, with effects on brain, heart, and teeth development. But how should you care for your babies teeth? Yasmin explains, breast milk is the best option for growing babies up to the age of 6 months. Breastfeeding also helps with the proper formation of the mouth and teeth and can help reduce the chances that your child will need braces later on in life! You should also avoid giving your baby a milk bottle at night as this can cause teeth decay. If your baby relies on a bottle at night, fill it with water instead of milk. Some studies suggest that when babies are first born, they do not have the bacteria that cause tooth decay and gum disease. So you should avoid salivary transmission to the baby when he or she is between 6-30 months as this is the most receptive “window of infectivity” for cavity causing bacteria. Your baby’s first teeth will begin to erupt at around 6 months. Even before teeth erupt, it is a good idea to develop good oral care. Moisten a piece of gauze and wipe your baby’s gums after his or her last feeding of the day. Once your baby begins to grow teeth, you can start using a soft toothbrush and a very small amount of fluoride free toothpaste. Do not begin using flouride until the child is able to spit on his or her own. Baby’s first dental visit should be around his or her first birthday. This will get your baby accustomed to the dental setting and allow your baby to begin forming a relationship with your dentist. The dentist can also answer any questions you have about your child’s oral health at that time. Pregnant? Learn how to take best care of your teeth during pregnancy here. We caught up with NYC's fave wellness blogger duo, Sweats & the City to get the lowdown on their favorite food, exercise and wellness routine. Floss Bar: Tell us about about you and what you do? S&C: We are Elizabeth and Dale, the duo behind Sweats & The City. We love all things health, fitness and beauty and love to share our experiences with our followers. We floss every day and brush our teeth minimum 2x a day. We sometimes use home whitening strips. Floss Bar: What did you have done at Floss Bar and how was your experience? We both had one round of teeth whitening. The staff was really pleasant and our teeth came out pearly white! Floss Bar: What are your best wellness tip for a busy person? We are big on prioritizing. This means making sure we are prepared, so we aren't stuck making unhealthy choices. We grocery shop and meal prep on Sunday's to set ourselves up for the week, so we're not stuck ordering in seamless or buying our lunch everyday. and have a pretty good idea of our workout schedule that week. We believe in scheduling your workouts like a meeting, put them in your iCal! Also, coordinating our workout schedule with friends to keep things social without having to always rely on dinner or drinks! Floss Bar: Favorite healthy food spots in NYC? We love Westville, Bondi Sushi, Sweetgreen, the Butchers Daughter, and Juice Press! Floss Bar: Favorite exercise routine? A mix of light cardio and sculpting is our favorite. We love a little bit of dance cardio with sculpting routines (think: Megan Roup, Tracy Anderson Method, AKT, Body by Simone and Torch'd at Soul Annex) and we love our barre and pilates classes! High intensity cardio we don't do as often, it's more of a mental workout for us. Our in-house expert YASMIN CHEBBI, DMD walks you through it! Hormone changes in pregnant women cause gums to be more sensitive and prone to inflammation than they usually are. Few know just how important healthy gums are for healthy babies - gum disease can actually lead to premature births. Take extra care and brush two times a day and floss at least once a day to prevent bleeding and inflamed gums. Eat a healthy and balanced diet while pregnant. A diet rich in calcium is important as your baby is developing as well as forming teeth! If you experience morning sickness, make sure to rinse away the acidity in your mouth with water. Try to eat smaller and more frequent meals low in sugar to prevent decay. Inform your dentist if you are pregnant or think you may be pregnant. It is best to avoid x-rays and large dental procedures when pregnant. However, if there is an emergency or you have pain, your dentist may need to perform emergency treatment. It is common to come in more often for cleanings during pregnancy, see what your dentist say and remember to floss! If you are a parent already, take a look at our blog post on how to take care of your baby's teeth! You have probably come across different whitening brands before such as Zoom, LumaWhite and Opalescence. At Floss Bar, we are using a brand new system, Pola Office+. Many customers asks us about it, and if it really can be as good as the other systems considering its amazing price? The short answer is yes, it is. 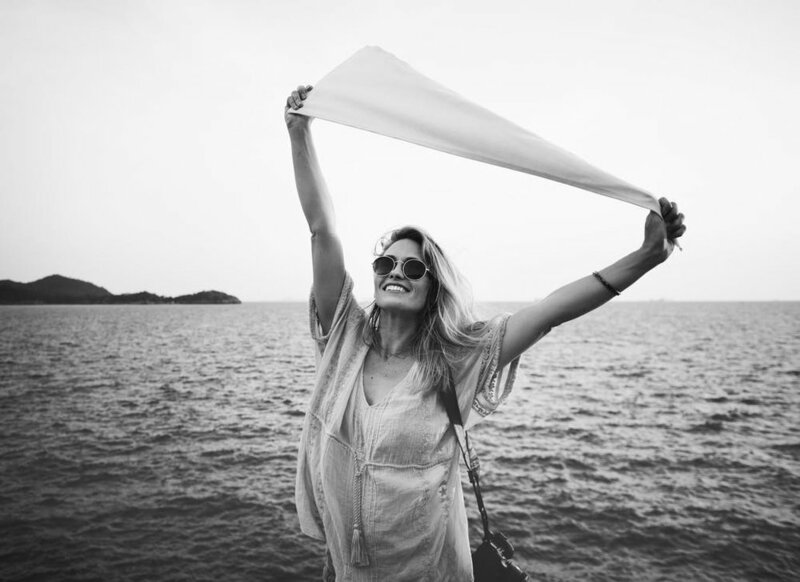 We love Pola Office+ for a number of reasons: our whole team uses it, we believe it provides the same or better results in a more efficient and cost-effective way, it is also FDA approved. As far as sensitivity, all of the chemicals used in whitening systems are strong. That is why you can only get them applied at the office supervised by professionals. Sensitivity is mainly a function of chemical, temperature, enamel quality of the patient, and how well we are able to cover the gums. Pola has the advantage of being a light-free system, which means it does not require a heat lamp during the process, which makes tooth sensitivity worse. This balances out the additional sensitivity which could have been caused by the chemical percentage being higher. As long as you are a good candidate and use sensitivity toothpaste, this should not be a problem. At Floss Bar, assessing the new products on the market is something that enables us to stay cutting-edge. We hope you enjoyed taking a look under our hood! Book your Pola whitening with us today! Ever been away on a trip and realized you forgot your toothbrush? 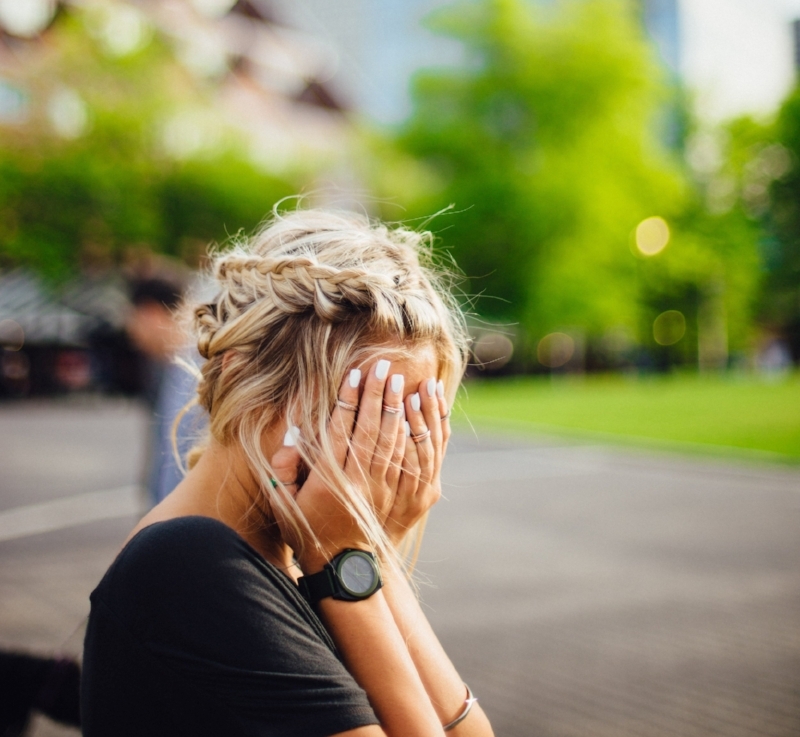 It’s happened to the best of us, but, what to do in these situations? If you are at a hotel, ask the receptionist for a dental kit, they usually have toothpaste and a toothbrush pack available for guests. Drink plenty of water and rinse vigorously with water after a meal to disrupt the food and bacteria laying on your teeth. Wrap a small piece of paper towel around your finger and apply a bit of toothpaste if you have it. Brush your teeth in circular motions just as you would with a regular toothbrush. Rinse out with water when done. Try to avoid sticky and sugary foods until you get a proper toothbrush. Vegetables and crunchy fruits like apples are great snacks in these situations; they are low in sugar and help clean plaque from teeth. Remember, these are just quick remedies in case of a toothbrush emergency. Get a toothbrush as soon as possible! At Floss Bar, we love our patients who helps us spread important health and wellness tips to others. This week, we caught up with Alyssa Brieloff, the creator of the Zen Tribe. Floss Bar: Hey Alyssa, Tell us about about you and what you do? Alyssa: I am a wellness lifestyle blogger living in NYC. My blog, The Zen Tribe provides tips for living a more "hoLYSStic" life. Alyssa: I always have suffered from sensitive teeth, so I use Sensodyne as my main toothpaste. I floss 2x a day and sometimes use oil pulling or charcoal for whitening and detoxing. My favorite floss is cocofloss from Credo Beauty. Alyssa: I got the teeth whitening treatment and it went really well. I was nervous because of my sensitivity and my gag reflex, however, the staff took exceptional care of my needs and concerns. Floss Bar: How often do you generally go to the dentist or hygienist? Alyssa: I visit my dentist every 6 months for a routine cleaning. Alyssa: Bring your favorite healthy snacks with you on-the-go so you aren't obligated to purchase an unhealthy option. I pack my favorite items with me in my bag the night before depending on my schedule the next day. I usually pack a bag of almonds, a travel water bottle, my primally pure organic deodorant, natural hand sanitizer, and crystals for protection. Floss Bar: Favorite exercise routine, how do you keep in shape? Check out Alyssa's blog here. are you Kissable for Valentine’s Day? Bad breath is a kissing deal breaker, don’t let it happen to you! Our in-house expert Yasmin Chebbi, DMD comes to the rescue with her best tricks to avoid bad breath and get you ready for Valentines. Got dinner plans? Steer clear of dishes with garlic and onions as these can cause bad breath. If you go there, bring floss with you to dinner and pop a mint or some sugar free gum afterwards. When was the last time you had a proper clean? Chronic bad breath, or halitosis, is caused by nasty bacteria lurking in our mouths. They can be hiding in our gums, teeth, or even tongue! Ahead of Valentines, be extra careful and make sure you are brushing at least two times a day and flossing at least once a day- and don’t forget to brush your tongue with a tongue scraper! If you still feel you have bad breath, it means it’s time for a dental visit. Valentines is also a day of desserts and wine- yummy indulgences that can cause cavities and stain your teeth! My best tips are to avoid chewy and gummy candies that can stick to the teeth. White wine and dark chocolate are better choices. Smoking is terrible for your oral health, causes bad breath, and stains your teeth yellow. Whitening is a great option to take your smile to the next level, but really, just quit smoking already! Have you tried New York's fave pre-date night staple yet, the Floss, Polish and Go? A quick 10 minute treatment that will leave you feel fresh, minty and ready for your big night. Do you ever wake up tired with a sore jaw? It could be nocturnal bruxism. Bruxism, or grinding, can be triggered by stress, anxiety, depression, caffeine, smoking, heavy alcohol use and sleep disorders. Grinding not only disturbs your sleep, it can also cause gum problems, jaw pain, and in worst case fractured teeth! Your dentist may be able to determine if you grind from many reasons including a jaw that clicks or “pops” and noticing areas of wear on the tops of your teeth. If you think you are grinding your teeth at night, visit your dentist to ask about the best treatment option for you. You will sleep better, wake up refreshed, and save your teeth and jaw from damage! We at Floss Bar is a fast-growing brand on a big mission. We are working towards helping the nation achieve better health by making basic dental care seamless and less expensive. We know that over 40% of American’s are not going to the dentist, and price is a major factor why. Therefore, as a way of keeping our promise and work on our mission, we started our pro-bono dentistry program. We want to make sure that individuals with financial constrains will also have access to basic dental care, and in February we have teamed up with Volunteers of America to give 20 families in need clean teeth at a NYC Shelter of their choice. Are you an organization that support people who could benefit from Floss Bar’s pro-bono dentistry? Oral hygiene is a key part of overall health, help us help people in need, apply here to become a Floss Bar charity partner. Volunteers of America is the charity that always steps forward to help the most vulnerable. For over 121 years, we have taken on the most difficult tasks to help the most underserved. Floss Bar's mobile team can bring hygienists directly to you! At Floss Bar, we are constantly looking at ways to do dental differently and bring innovation to an industry that is in desperate need for it. With over 40% of Americans avoiding the dentist, we figured something must be missing. What we are really trying to address is why people aren’t going. There are three major obstacles; people are scared to go, it is too expensive and it is very inconvenient as dentists keep traditional opening times - basically the times where the average American is the most busy. Our offices are open evenings and weekends and staffed with only the friendliest hygienists. All booking, forms and payments is online. We take all the major insurances. But now it has become even easier. Our mobile team can show up at your workplace or your home! Unsurprisingly, dental innovation indeed reached the employees of Google, Facebook and Yahoo in Silicon Valley. They get their dental done in luxury vans in their parking lots. Sure, that sounds nice and convenient, but it's not a solution for cities like NYC where parking is near impossible. How is Floss Bar’s mobile dentistry the solution? We bring dentistry directly to your home or office. We offer our team mobile services for half the NYC price. You are done within 45 minutes and you don’t have to waste any time commuting or in the waiting room. Instead of dental vans, we make things even easier and bring the dental chair to your office, our own water supply and of course our 5-star hygienists. We are also rolling out a service for executives who have been neglecting their health and teeth for too long due to hectic workdays. Now you can book an exclusive dental cleaning just for you, in the comfort of your own office or home! 1. Book a day from the bookings page. Let us know if your team is using insurance, credit cards, or a mix of of both. So talk to your team and let’s make this happen or book your executive appointment here.